I’ve had openSUSE 13.1 installed on a Lenovo ThinkPad X220 for the past weeks and it has worked pretty well. I’ve used the GNOME desktop mainly because it has the ability to call up a search box with a single button (the Windows key on this laptop). That allows me really easy access to most functions I need to accomplish. However, GNOME 3 has bugged me more than a little bit for one major reason and I’ll use some pictures to illustrate it. Notice the subtle difference? Here are two more pictures to illustrate a little bit better. It is really subtle and only noticeable on a small screen (like the X220’s 1366×768). 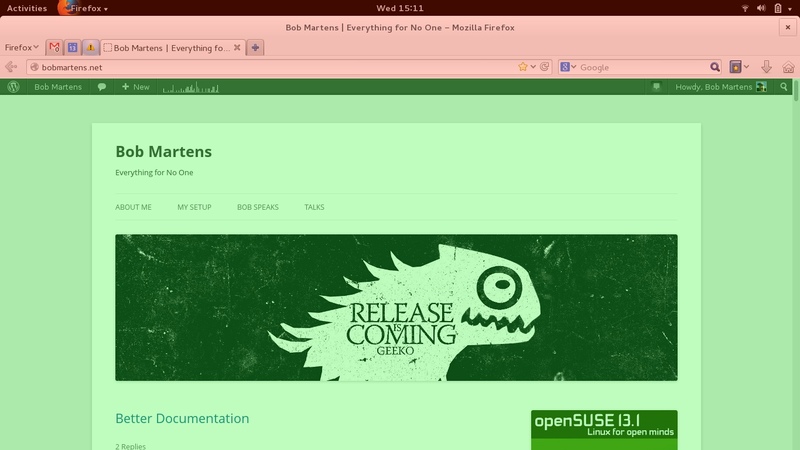 The usable area for a Firefox window in openSUSE 13.1 GNOME is 634 pixels high. 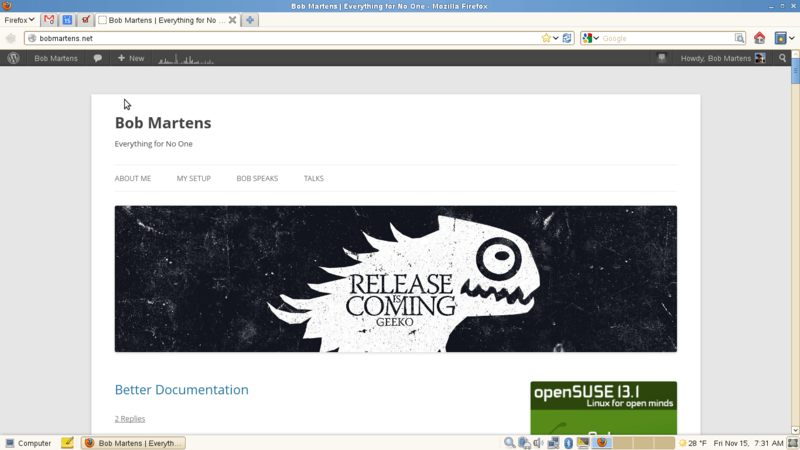 On SUSE Linux Enterprise Desktop (SLED) it is 657 pixels high. While that difference of 23 pixels (give or take a few, I was just cropping the images in Acorn) might not seem like a lot, on a screen where pixels are at a premium it can make a sizable difference in just how it feels. The SLED desktop, at least in this instance, just feels a little less cramped. Now, this is an extreme case, obviously, but it makes a difference. Smash such large toolbars on the top of the screen feels oppressive in a way that the SLED one does not. GNOME 3 overall just feels a little bit heavier than GNOME 2 at the moment on these screen sizes. On larger screens, obviously, the differences are not as drastic. At this point I should state that GNOME has taken a decidedly Apple-ish approach here with Apple’s persistent toolbar along the top of the screens. I don’t have an exact analog with which to test it with to see how Firefox fares on, say, an 11″ MacBook Air which has the identical screen resolution. I’ll try to have a friend screenshot that soon so I can pull it apart. The point of this was not to bag on GNOME 3, but to point out one difference I have noted so far between the openSUSE GNOME 3 and SLED GNOME 2 design directions and the feeling I have when using them. It is interesting, at least.